Last night it snowed. Again. This has happened twice within two weeks, one of those days being Christmas (and I live in Georgia...where when/IF it snows, it usually doesn't stick). I can't even begin to describe my happiness. PLUS...(oh yes, it gets better! ), not only did I have the day off from work today, but I also have tomorrow off...and so does my hubby! This has been a red letter day, people. 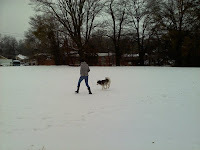 Pierce and I got up around eleven and played outside with our Siberian husky, Bella, and took lots of pictures. Then we napped and watched a movie. And after that we cleaned and I made homemade chicken parmesan with angel hair pasta. OH! I almost forgot...P found my New Moon soundtrack under the bed while we were cleaning, so this day has pretty much been THE. BESTEST. EVER. I'm currently enjoying the sounds of Thom Yorke's "Hearing Damage". Tomorrow we plan on sledding down the ice on our street using our Rubbermaid storage container lids. But for the rest of the night, we're going to enjoy being snowed in together and having no worries about a curfew :). Now, on to the Chick Lit Plus Challenge! I have officially started reading my first choice for the challenge: Susan Rebecca White's A Soft Place to Land. I've given myself a little bit of room with this one because it strikes me as more women's fiction than chick lit (I find that I tend to lean more towards family drama and the "serious" side of "girly" books, with the exception of a few favorites like Emily Giffin, Lauren Weisberger, etc.). I have seen other blogs recommend White as a terrific storyteller, some of them chick lit fans, and so I'm gonna stick with my choice. Plus, Barnes and Noble didn't have Giffin's Heart of the Matter or Donnelly's Life After Yes, and, when I opened the front cover of White's novel, I found that it was an autographed copy! Apparently, B&N had some left over after a signing and just shelved them...good news for me! I like to be pulled into a story from the first sentence, which did not happen with A Soft Place to Land, but I am not worried. Not only do I know from experience that, sometimes, the best books start slow (Yann Martel's Life of Pi), White's novel was recommended by Kathryn Stockett, author of the the UH-MAY-ZING The Help (and I'm going to brag a little here and tell you guys that I met her in Buckhead last year at a luncheon and she signed my copy...hooray for autographed books! ), so I trust that I will not be disappointed. Be on the lookout for my review of A Soft Place to Land here on ABC! 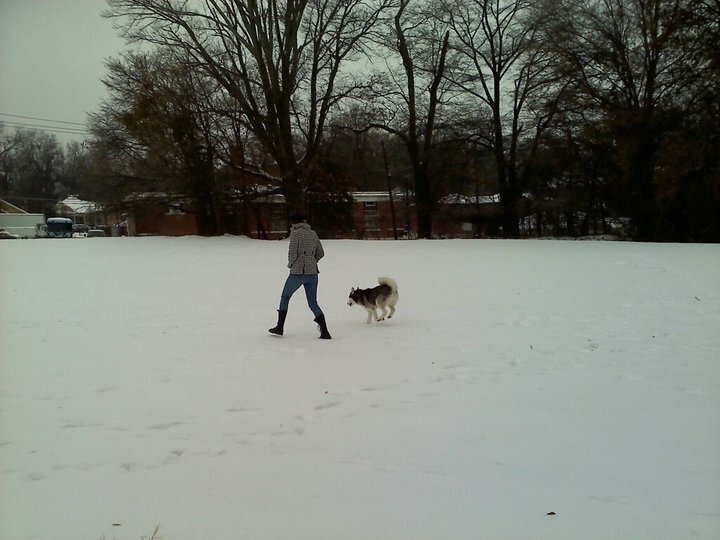 For now, it's back to my snow day with the hubby. Book 1, Book 2, book thing, book you?